The BlackBerry Storm2 is almost identical to the original, which we liked, but with updated software and Wi-Fi connectivity. The touch-screen is responsive but takes some time to master. Email is a breeze, as expected from a BlackBerry device, and the on-screen QWERTY keypad makes typing quick and comfortable. There's a lot in here to get used to. There are too many features in the BlackBerry Storm2 to even mention in the space of one review. You can sync up to 10 email accounts, the QWERTY keypad is great, and there are some handy shortcuts on the user interface. The camera has room for improvement. The BlackBerry Storm2 is a massive improvement on its much-maligned predecessor. There's fast internet browsing thanks partly to the inclusion of Wi-Fi, and the touch-screen is responsive. The BlackBerry Storm2 has average battery life, with three hours of talktime. When we reviewed the original BlackBerry Storm, Palm's first touch-screen handset, we liked it. But Stephen Fry didn't, and he tweeted extensively on the subject. Partly because of the celebrity non-endorsement, and partly because there were a lot of returns due to faulty software, the Storm didn't sell tremendously well. Now RIM finds itself in the position of having to win over a hostile crowd and please the critics in its bid to join the hallowed ranks of hero handsets including the HTC Hero, Palm Pre and iPhone. Of course RIM has updated its software and added some new features on the BlackBerry Storm2 , but it's almost exactly the same as its predecessor in terms of appearance, feel and handling. Like the original model, the BlackBerry Storm2 includes RIM's SurePress clickable touch-display, a feature that has divided users' opinions. The capacitive screen needs only very light swipes to navigate the menu, but selecting a menu icon requires a hard press until you hear a faint click. It's certainly more intuitive than the first version was, and it works well, but it feels strange and a little creaky. The BlackBerry Storm2 has a polished black front fascia, a brushed steel back and metallic trim, the make the handset look and feel elegant. On the clickable screen below the display area sit keys for call, menu, back and call end. The front of the phone is otherwise clutter free, the hard keys sitting on the side. On the right are the volume and dedicated camera keys, on the left is the voice-dialling button, which we'll look at later. Two soft keys sit on the top of the phone: a power button, which you press quickly to lock the phone; and a useful key that you can hit to silence calls and alerts. The accelerometers on the BlackBerry Storm2 are really rather clever. As expected, when you turn the screen horizontally the page format follows, but here, you can turn the phone any way you like and the screen will correct itself to fit. It's particularly handy for left-handed people; we tried it out on a southpaw in our office who found that she could naturally turn the phone and the screen would follow, instead of having to think about it. On your home screen, you have eight icons running along the bottom, from which you access your messages, contacts, email and internet options. If you turn the phone on its side you get the full menu. This displays 12 icons at a time, with the funky touch that they glow blue as your finger hovers over them. When the phone's in landscape format, you get use of a full QWERTY keypad. This is far more reliable and intuitive than the SurePress keypad you get in portrait position. We did find, though, that it was easier to type if you held the phone with one hand and typed with the other. Whenever we tried one-handed texting, we ended up hitting the key next to the one we wanted. For all its touch-screen flash, the Storm2 is still a BlackBerry, with all the email prowess that suggests. It only took us a couple of minutes to sync two of our email accounts online, and the messages were pushed to our handset as they arrived. When you get a message, a little red light in the top right-hand corner of the screen starts flashing and the icon corresponding to that account is highlighted with a red star. You can download the Facebook application for free from BlackBerry's app store, App World. It's not really a match for other app stores like Google Android Market or Apple App Store, but it's fairly new and still very much a work in progress. The Facebook app, though, is brilliant, bringing you a PC-like experience with a couple of nifty mobile features thrown in. As well as being able to upload photos directly from your phone to your Facebook page, you can also take pictures while in Facebook. Our favourite new feature is any dates for events or birthdays you have on Facebook will automatically transfer to your BlackBerry Storm2 calendar. Facebook will also sync with your contacts, so any Facebook friends in your contacts list will pop up with a profile picture when you call them. Your contacts list gives you space for a range of information including their home address, website and even job title. When you enter the details, the keypad switches between letters for names and details and numbers for... well, numbers. If you think that finding a number and pressing on it is just too old fashioned, then the BlackBerry Storm2 gives you the option of voice dialling. The button is on the left-hand side of the handset, which leaves it prone to accidental tapping, but other than that, the function works effectively. Even in noisy environments like a busy street or a car, it recognised our commands. It's a shame that it doesn't work for getting applications of music, like on the iPhone, but it's a nice little feature anyway. There was no Wi-Fi on the original Storm, which was a bone of contention for critics. Cynics suggested that this was because the Storm was a Vodafone exclusive and the operator wanted users to browse the web via its proprietary network. 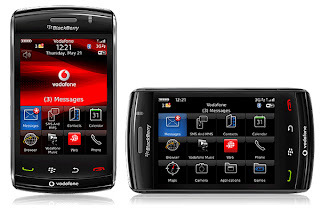 Whether or not that was the case, the BlackBerry Storm2 does have a Wi-Fi connection despite its Vodafone exclusivity. It took no time at all to connect to our office hub, and web browsing was pretty quick on both Wi-Fi and the Vodafone network, only starting to struggle when we downloaded larger pages. The large, 3.25-inch display allows you to view most web pages in full, without having to use mobile-optimised versions. You do need to zoom in sometimes, and there are two ways to do it. The first option is to lightly press – not click – the bottom of the screen to bring up a toolbar. The second is to click on the part of the screen you want to zoom in on to magnify the screen a step at a time. It took a while to get used to, and of the two, we found the toolbar the most intuitive option. The copy and paste feature is equally difficult to master. Lightly press two fingers anywhere on the screen to bring up two icons that can be moved to highlight the text you want to copy. Only it's not that effective – in fact, we gave up on it in the end. Navigation is a pleasure on the Storm2. BlackBerry Maps and GoogleMaps are both available, giving you a happy choice of mapping software. We got an almost instant A-GPS fix that stayed with us even inside buildings. The 3.2-megapixel camera is par for the course for a BlackBerry device, which aren't known for their photography prowess. There is an LED flash but it just drains pictures of colour. You can't change setting in viewfinder, so can't experiment to get the best shot, and the zoom stutters. There are all sorts of features packed into the BlackBerry BlackBerry Storm2 , so many, in fact, that we haven't even touched on some of them, like being able to invite others to join a phone conversation. But the Storm2 just doesn't offer as smooth an experience as other smartphones on the market. It looks elegant, and the email is predictably efficient, but it has a way to go before it knock other smartphone titans off their pedestals.